I love knowing smart people. I also love skype. It’s the only place I know where you can put a list of ingredients into a room and someone smart comes up with dinner plans for you. Granted it’s just roasted potatoes and I didn’t follow some of the MUST DO RULES (because I am a rebel like that). Look at her recipe, for the real HOW TO MAKE HEATHER TOTS ALSO KNOWN AS Roasted Potatoes. 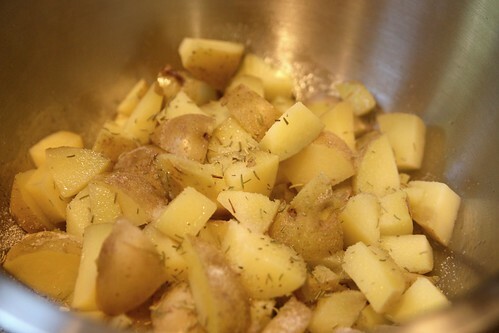 See my taters below….then see the yummy goodness she created. Watching the vid and DROOLING! I hardly *ever* yell while drooling, but that’s how delish this looks.